Police in Panama say they have arrested a Canadian member of the Hell's Angels motorcycle gang wanted in Canada on charges including 22 counts of murder. Michel Smith was arrested on Friday in the tourist region of Playa Coronado after a two-month surveillance operation, a police statement said. Panamanian authorities say they are organising his extradition to Canada. Mr Smith has been on the run since a crackdown on the gang by Canadian police in 2009, according to police. As well as charges of murder,a warrant issued by Canadian policesays Mr Smith is also wanted on charges of drug trafficking and gangsterism. 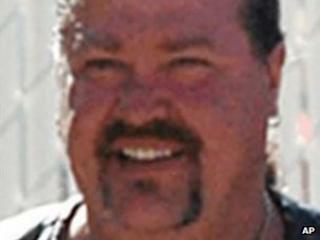 The warrant says Mr Smith belongs to the South Chapter of the gang in Quebec province. The 2009 raids resulted in the arrest of over 100 members and were the culmination of three years' police work. Those arrests were related to alleged murders and drug crimes between 1992 and 2009. In that period, the Hell's Angels' "biker war" with another Canadian gang, the Rock Machine, peaked. Canadian police have long maintained that members of the Hell's Angels have been involved in alleged criminal and drug activities, organised crime and widespread violence.